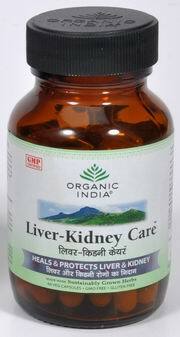 Heals and Protect Liver and Kidneys. Each 325 mg vegetarian capsule contains: Bhumyamalaki (Phyllanthus niruri) – 125 mg, Punarnava (Boerhaavia diffusa) – 100 mg, Katuki (Picrorhiza kurroa) – 100 mg. Hepatitis A, B, C and others, jaundice, hepatopathy with oedema and ascites, fatty liver, alcoholic and other cirrhosis, gall bladder and kidney stones, chronic renal failures, UTI, pyelo and glomerular nephritis and other infections, anemia. Explore more Organic India products.